I started my Dear Jane quilt in January 2008. I’m in a block of the month group via mail from Stitchin’ Heaven in Texas. Every month I get fabric for 10 blocks. It has been 8 regular blocks and 2 triangles. I also have been sent the fabric for the sashings. Also included in my monthly packet are great pages of how to construct each block! That is so worth my monthly fee!! 🙂 Many tips and hints and she’ll even give alternate methods for the block construction. I can’t imagine flailing on my own! Now that I look at this, I think there are a few more blocks that need scanned and input that are finished. Obviously missing 2 triangles at least. The fabrics are civil war reproductions and the backgrounds are scrappy creams. I like that the colors they are using are similar to the original and are going to make the same Trip Around The World layout. I have the book & software by Brenda. I really enjoy the perks of using the DJ software. I print out the journal pages and have been writing one for each block. I have the fabric swatches on each page. My favorite method for piecing is paper piecing so love that ease of printing out the pp templates from my computer. I piece on freezer paper. January 2009 Goal: I’d like to complete another month of blocks and start adding the sashings. I’d love to join with some local quilt guild ladies that work on their DJ’s the first Tuesday of the month. However, that first week usually slips by me before I remember! Oops! Hi Joyce….drop me a line at the yahoo noted. I am with Extension, Family & Consumer Sciences Agent, just began third year. We have a quilt Show in the fall with our homemakers. There is a gal that has some pre-civil war crazy quilt blocks that are awesome!!! I will send pix if you want to see! This year was hard during the show as I wanted SO MUCH for Mom to be there! She was in spirit. I don’t miss HER as she is ALWAYS with me. I miss being able to pick up the phone and talk to her! You look great….seems like fibromyalgia in better control…K’s works looks awesome! The men in your life look pretty good too!!! We are beginning to buzz about a 30yr AHS reunion….. Thanks for visiting my blog. I just found your Dear Jane. I have one posted on my blog that a friend of mine did this past year, just finished it. I want to do one next. You can see it by scrolling down to my labels and see Dear Jane. Hope you visit my blog again. easy one at fist I will like to find some friend in Montreal who enjoy making the dear jane quilt. I find some on the web. 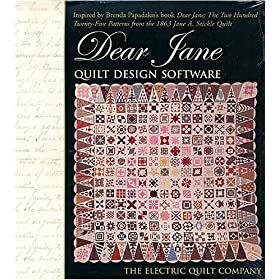 I finally got my Dear Jane book and am itching to start a block, but there are so many to choose from! I like your page and wanted to thank you for sharing. Varma hälsningar (Warm greetings) from a California gal living in Sweden. So… I’m thinking of doing a Dear Jane BOM with Stitchin’ Heaven… I was wondering if you thought there was a good amount of fabric just in case I make a mistake. Thanks! I am starting the border and I am unsure how to put the scallops on the triangles. Any tips? I haven’t gotten to the scallops yet! I hope yours have gone all right. I don’t know much about English PP but if you are confident in that, I’m sure you’ll be able to adapt to your methods. The book only has line drawings so you have to come up with your own way to piece and applique anyway. I just found your blog when I searched for Dear Jane BOM. I just signed up for StitchinHeaven BOM for it as well. Glad to read such a good review. Hi Jules! I am so excited to see your blog. My mother in law started the Dear Jane quilt using materials from Stitchin Heaven’s 2008 BOM. I have all her materials, books, and tools. I am determined to finish her quilt for her. What I don’t have is a photo of the finished quilt using the fabrics from the BOM program. From your photo, I can tell it’s the same color way. Would you have photo of the quilt that you could share with me? I thought there might be a photo from an old catalog or advertising for the BOM. Thanks!